If the smart key is not in the vehicle and if any door is opened or closed with the engine start/stop button in the ACC, ON, or START position, the warning illuminates on the LCD display. Also, the chime sounds for 5 seconds when the smart key is not in the vehicle and the door is closed. Always have the smart key with you. If the smart key is not in the vehicle or is not detected and you press the engine start/stop button, the warning illuminates on the LCD display for 10 seconds. Also, the immobilizer indicator blinks for 10 seconds. 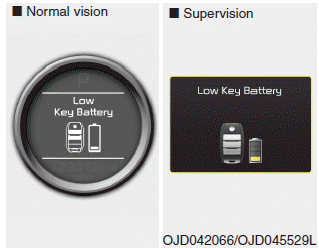 If you press the engine start/stop button while the warning “Key not detected” illuminates the warning “Press the start button with smart key” illuminates for 10 seconds on the LCD display. Also, the immobilizer indicator blinks for 10 seconds. 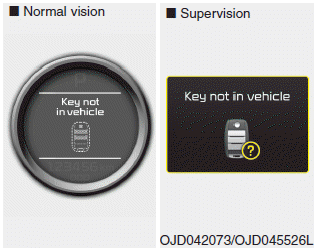 If the engine start/stop button changes to the OFF position when the smart key in the vehicle discharges, the warning illuminates on the LCD display for about 10 seconds. Also, the warning chime sounds once. If the engine start/stop button changes to the ACC position twice by pressing the button repeatedly without depressing the brake pedal, the warning illuminates on the LCD display for about 10 seconds to indicate that you should depress the brake pedal to start the engine. If the engine start/stop button turns to the ACC position twice by pressing the button repeatedly without depressing the clutch pedal, the warning illuminates on the LCD display for about 10 seconds to indicate that you should depress the clutch pedal to start the engine. If you try to turn off the engine without the shift lever in the P (Park) position, the engine start/stop button will turn to the ACC position. If the button is pressed once more it will turn to the ON position. The warning illuminates on the LCD display for about 10 seconds to indicate that you should press the engine start/stop button with the shift lever in the P (Park) position to turn off the engine. 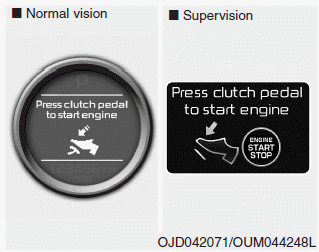 If you can not operate the engine start/stop button when there is a problem with the engine start/stop button system, the warning illuminates for 10 seconds and the chime sounds continuously to indicate that you could start the engine by pressing the engine start/stop button once more. The chime will stop if the engine start/stop button system works normally or the theft alarm system is armed. If the warning illuminates each time you press the engine start/stop button, we recommend that the system be checked by an authorized Kia dealer. If you try to start the engine with the shift lever not in the P(Park) or N(Neutral) position, the warning illuminates for about 10 seconds on the LCD display. You can also start the engine with the shift lever in the N(Neutral) position, but for your safety start the engine with the shift lever in the P(Park) position. 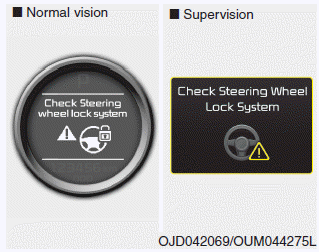 If the steering wheel does not unlock normally when the engine start/stop button is pressed, the warning illuminates for 10 seconds on the LCD display. Also, the warning chime sounds once and the engine start/stop button light blinks for 10 seconds. When you are warned, press the engine start/stop button while turning the steering wheel right and left. 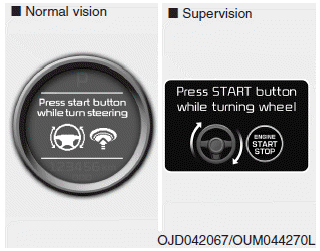 If the steering wheel does not lock normally when the engine start/stop button changes to the OFF position, the warning illuminates for 10 seconds on the LCD display. Also, the warning chime sounds for 3 seconds and the engine start/stop button light blinks for 10 seconds. When the brake switch fuse is disconnected, the warning illuminates for 10 seconds on the LCD display. Replace the fuse with a new one. 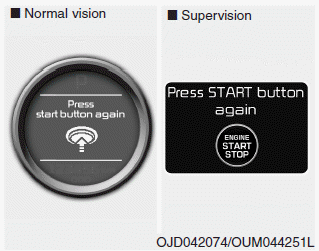 If that is not possible you can start the engine by pressing the engine start/stop button for 10 seconds in ACC. When the engine coolant temperature exceeds 115°C, this message will be displayed and the torque will be reduced to protect the engine.